I love teacher/employee appreciation gifts! There are so many great ideas out there and fun things that you can do that are inexpensive, nice and enjoyed by one and all. I was able to help with the decorations for my child's school this year and it was so much fun to pull together. Here are some of the decorations that I created including a chalkboard sign (they are so popular right now! 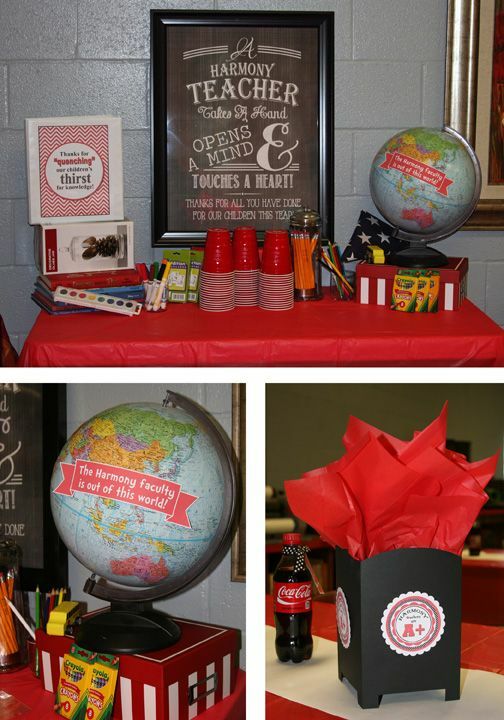 ), a globe with a cute sign that said, "HARMONY TEACHERS ARE OUT OF THIS WORLD! ", a daily sign that I put in the front of a three ring binder to let the teachers know the theme for the day and lots of my son's school supplies to add color and depth to the vignette. The biggest impact was the chalkboard sign which was super inexpensive to print. Since it is a black and white print you can get an 18x24" sign at print shops for $3.50 by asking them to print it like an architecture print. I also changed out the items to fit each days theme like I added popcorn boxes with tissue in them and a popcorn machine (that I got for $15 online at the Walmart) on the popcorn day, jars and gumball machine for the candy day, cake stands for the donut day and lots of soda and sonic ice for the drink day. I also made table decorations with card stock, tissue paper and a cute round sign on each side that said, "Harmony Teachers are A+". If you are ever in charge of a dinner event and are not given a budget for table decorations...these are the best! You can decorate each table for under $2. The other thing that the PTO committee did was get amazing gift cards from local businesses and they hung them from a Christmas tree. Each day they would announce the winners from that day so everyone on staff got one card. I heard there were even a few teachers that would run down the hall once their name was announced so that they could get the gift card they had been eyeing like bags from thirty-one, manicures, pedicures, popular clothes stores, restaurants, Target, etc. Thanks for quenching our children's thirst for knowledge! We started with ice from Sonic because everyone knows they have the BEST ice around! Our teachers enjoyed it so much we kept it filled up throughout the week. So if you do a soda or drink themed day make sure you stop by Sonic and fill up your ice chest! They may even give it to you for free if you contact the manager in advance and tell them it is for a teacher appreciation event. Then one of the moms purchased 2 liter bottles of soda for just about every type you can imagine, flavored drink packets (like lemonade) to add to water and tea. 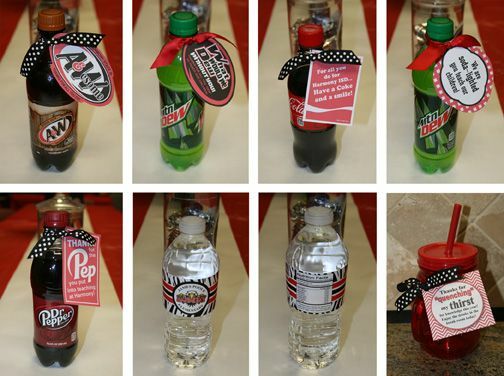 I purchased smaller soda bottles and added tags that I created to match the drink's logo as well as a water bottle label created just for the school. The water bottle has a custom label with a school logo. The empty drink container was given to my child's teacher so she would have something fun to fill up all week and it said, "Thanks for quenching my thirst for knowlege this year! Enjoy the drinks in the teacher's lounge." Have a poppin' good day! You are pop-pop-popular with your students! 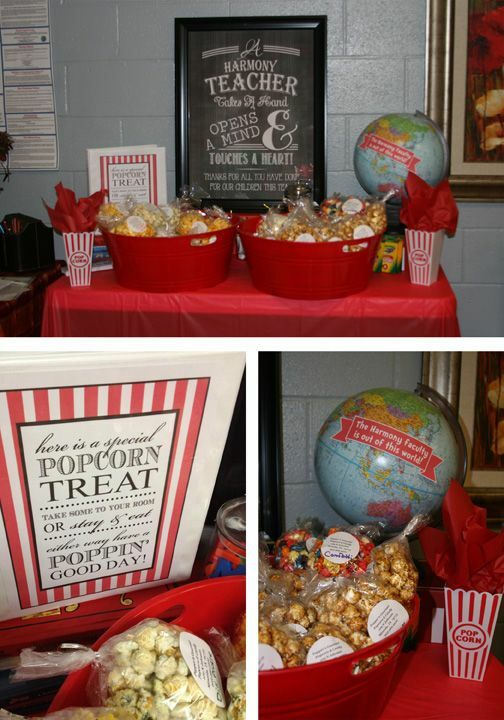 The PTO president had a local popcorn company bag up a variety of different popcorn flavors from cajun and pickle to cheese and chocolate. You could also do plain popcorn and have bowls filled with things you can mix with popcorn like M&Ms, Reeses Pieces, Whoppers, Nuts, Rolos, Nerds, cinnamon and sugar, cheese flavoring, etc. You could even check with your local movie theater to see if they will donate the popcorn. Thanks for making our kids a bunch of SMART COOKIES this year! This was another fun day. 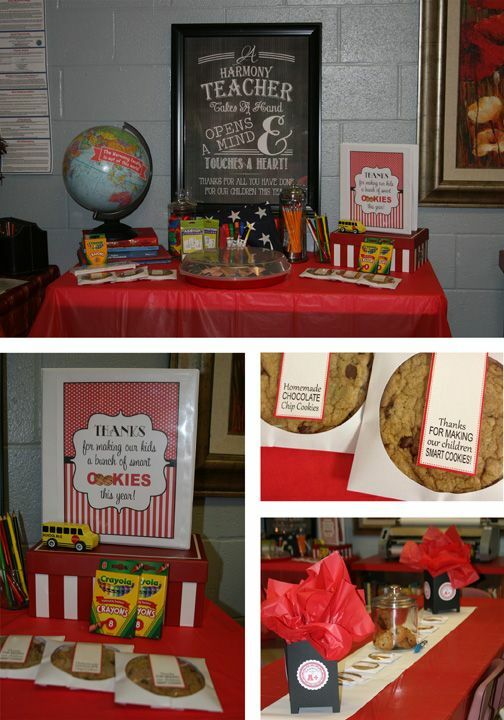 Our PTO president asked a group of mom's to each whip up 2 dozen cookies for our "smart cookie" day. I have lots of glass cookie jars so we placed them on the tables and teachers were able to grab cookies throughout the day. The Harmony Staff is extra sweet! 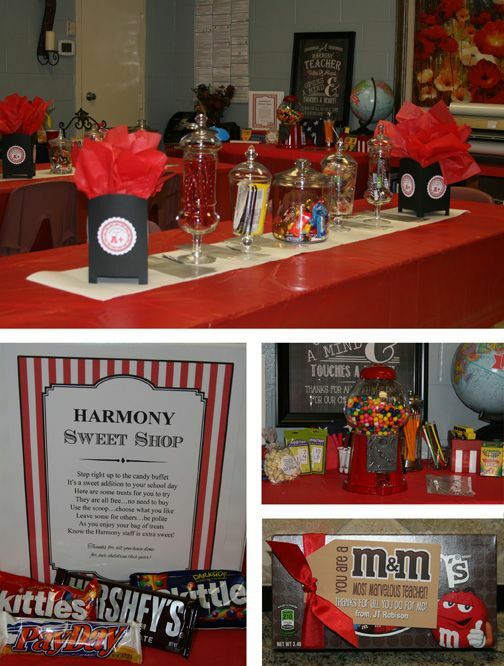 Know the Harmony staff is extra sweet! for our children this year! I thought there would be lots of candy left over but they did a great job filling up their bags of treats and will hopefully enjoy a sweet snack over the next week or two. "Donut" you know...you are the best staff ever! By the time we made it to Friday and donuts...I think teachers were inundated with sweets, but they still managed to grab a donut with their morning coffee. This was the first day that there were a few leftovers. 1. 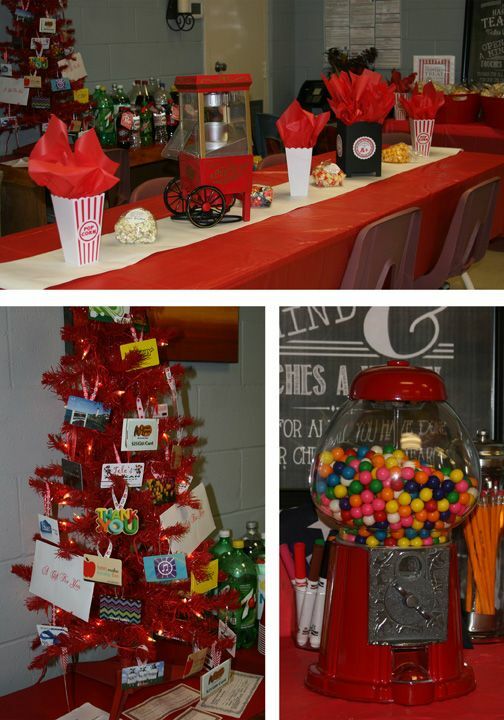 The teacher's really enjoyed that we decorated their break room and used fun plates, jars, tubs and stands for the food. We had so many great comments on how nice it was to come in and see all of the decorations and "classy set up" as one teacher said. We will definitely decorate the room again next year making sure to change things out each day. We may even decorate the room each month with a new theme throughout the year, as well as have each classroom decorate the teacher's doors. 2. The teacher's really enjoyed all of the food, but they did mention that it was a lot of sweet food. (This was not a complaint...other than the five pounds they gained from the cookies, candy and donuts). Next year we are considering having a "WE COULDN'T HAVE PICKED A BETTER STAFF" day during the week and filling the teacher's lounge with fruits, veggies and dips. Granted we will probably have some chocolate covered strawberries, but there will be some healthy good snacks to balance out all of the sugar. 3. Having the drink day on Monday was a perfect idea along with the all time favorite of Sonic ice. We purchased enough 2 liter bottles of soda that it lasted throughout the week, and replenished the Sonic ice on Wednesday so that the teachers could enjoy cold drinks all week long. The only thing I would add is at least a case of bottle water. We had a few bottles of water sprinkled on the tables but a case or two would be better to go with the flavored drink pouches. (Not to mention that bottled water is super inexpensive and a great thing for teachers to grab and go with a flavored drink pouch for a later day if needed.) Another suggestion I would make is to ask parents to help provide a 2 liter drink or two so that it doesn't come out of the PTO budget. 2 liters of soda are super cheap and parents would be happy to help provide this for your appreciation event! 4. The cookies were a great idea and by asking mom's to make them it saved the PTO having to buy them. 5. If you have a candy bar/buffet definitely make sure you have bags for them to fill up so that they can hide their stash in their desk and enjoy it for more than one day. 6. 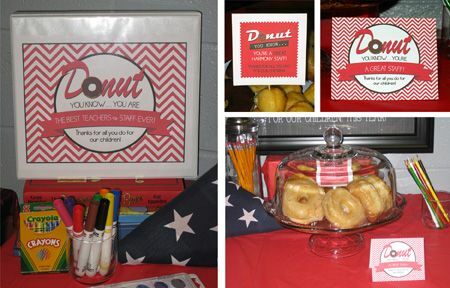 Donuts are a great finish to the week and again another great item to ask a group of parents to bring. They can each pick up a dozen donuts and drop them off first thing. They only thing I might add to this day is a coffee bar with coffee and some fun flavors to add to it (like chocolate, caramel, whip cream and more) so they can enjoy a fun drink with their donut. Or you could turn this day into a breakfast for the teachers with donuts, muffins, fruit, mini quiche, etc. If you make it a breakfast you will want to send out a note and have it set up extra early so that teachers can come and enjoy it before they head to their classrooms. 7. My best advice is to get lots of parent involvement with your event. I believe that most parents want to help especially with teacher appreciation...all you have to do is give them the opportunity. Try assigning a day to each grade and then asking the parents with a note to provide the item(s) for that day like the drinks, cookies, donuts, etc. or even having sign up sheets when parents sign in to come to their child's Easter party. The worst case scenario is that you may end up with too much of everything. How bad can that be??? If you get too much soda, the teachers can enjoy it throughout the rest of the school year or you can take them to the junior high and high school. If you get too many cookies, bag them up at the end of the day and put them in teacher's boxes to take home or drop them by your local fire station, police department, nursing homes, etc. Think outside of the box. 8. The other suggestion that I would make for a PTO working on a teacher appreciation week...don't just make it about the teachers. There is a whole staff at the school that makes your child's learning possible from the Principal, Secretary, Teachers and Teacher's Aides all the way to the Librarian, Nurse, Custodians and Cafeteria staff. We had a group of mom's take over the lunch and recess duties and sent all of the teacher's aides out to lunch one of the days and they loved it! Next year I hope we can bag up some of the goodies and take them to the staff like the custodians and cafeteria staff that may not get by the teacher's lounge for a break. All in all I think it was a truly great event and I can't wait to top it next year! I'm hoping for a week long theme like a Dr. Seuss, or "The Harmony Staff is Out of this World" or "Thanks for helping our children take flight this year" or "The Harmony Staff are Super Heroes"...there are so many possibilities. If you need help with printables for a teacher/work appreciation event contact Paper Perfection for pricing and details.